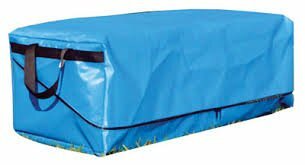 Hay Bale Cover � Heavyweight vinyl-coated bag large enough to hold a full bale of hay measuring 44 x 19 x 15 inches. Angled zipper closure makes it easy to put the hay bale into the bag. Two heavy web straps add to ease of handling. Great for transporting hay in your truck or trailer without the mess!